Last October, the Center for Compact and Efficient Fluid Power (CCEFP) held its biannual summit at the University of Minnesota. This network of fluid power research laboratories, academic faculty, and graduate and undergraduate students came together for a few days of presentations and showcases spotlighting the solutions to challenges and concerns that fluid power professionals face on a regular basis. Among the guests attending the Minneapolis event were professors Tom Chase, Tequila Harris, Perry Li, Ashlie Martini, Paul Michael, Eric Severson, Kim Stelson, James Van de Ven, and new CCEFP Director Zongxuan Sun. (To hear more about Professor Sun in his new role and his views on collaboration, see the February issue “Notable Words” ) Throughout the Summit, the attendees shared their presentations covering three areas: Energy Conversion and Storage; Fluid Power Components and Surface Modification; and Department of Energy-sponsored Projects. Kicking off the industry presentations for a day of shared learning and prospective collaborating was “Modeling and Optimization of Trajectory-based HCCI Combustion” presented by Professor Sun. Developed through the University of Minnesota’s Department of Mechanical Engineering, Professor Sun’s research examined the energy consumption by the modern transportation sector and its impact on the environment and human health, then explored the existing control methods in combustion-controlled engines comparing the emission performance and fuel efficiency. With a deep dive into the mechanics of trajectory-based combustion control, Sun and his research team found that optimizing the combustion phasing control led to better piston trajectory. The research team also found that it is possible to reduce the NOx emissions and increase efficiency at the same time using a new control-oriented model and the phase separation method. 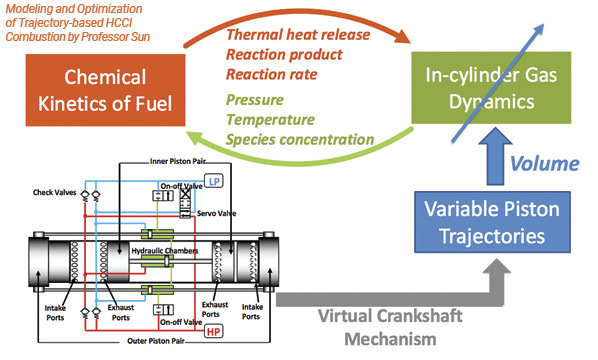 To learn more about Professor Sun’s trajectory-based combustion control research, as well as the controlled trajectory rapid compression and expansion machine (CT-RCEM), visit www.ccefp.org/engagement/summits. The remaining presentations of the Energy Conversion and Storage category included Professor Kim Stelson’s “Understanding the Transient Nature of Wind Turbine Response to Create Advanced Controls to Improve the Efficiency of a Hydraulic Drivetrain Wind Turbine;” Professors James Van de Ven and Eric Severson’s “Seamless Electric to Hydraulic Conversion;” and Professor Perry Li’s “Liquid Piston Gas Compressor/Expander for Compressed Air Energy Storage (CAES) and CO2 Sequestration.” Each presentation is available at CCEFP.org and can be accessed by consortium members. After a short break, the Summit turned its attention to the Fluid Power Components and Surface Modification category. In this focus area, the presentations included Professor Tom Chase’s “High Efficiency Hydraulic Pump-Motors Employing Partial Stroke Piston Pressurization;” Professor Tequila Harris’s “Science of Pattern Coating onto Heterogeneous Surfaces Using a Hybrid Tool;” and “Polymer-Enhanced Fluid Effects on Mechanical Efficiency of Hydraulic Pumps” by Researcher Paul Michael and Professor Ashlie Martini. 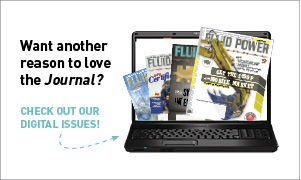 To learn more about Michael and Martini’s research examining the hydraulic efficiency, solution rheology, and molecular properties of polymers, see “Research to Watch” in the upcoming March issue of Fluid Power Journal. Van de Ven’s second presentation of the day walked attendees through his 36-month project tasked with developing a variable displacement linkage motor (VDLM) for propulsion of off-highway vehicles. With an objective of attaining an efficiency of >90% above 15% displacement, a torque ripple <5% of the mean torque, and a 30% reduction in fuel consumption, this project took the collaboration of multiple researchers and engineers from the University of Minnesota, the Milwaukee School of Engineering, Eaton Corporation, and Bobcat Docsan. Contrasting two methods to generate cam, Van de Ven explained the research team’s decision to first create a piston trajectory before analyzing the motion of linkage. In doing so, the team was able to calculate cam that moved linkage in only the way the team desired. With cam analysis complete, the researchers moved forward with generating piston trajectory and the testing of the VDLM kinetics, and in the process, the project team was able to develop a more efficient, compact, and smooth variable propulsion motor. To learn more about Professor Van de Ven’s value propositions, valve timing, and energy efficiency analysis, visit www.ccefp.org/engagement/summits. The fall CCEFP Summit provided an opportunity for industry professionals and academic partners to share their hard work, analyses, and conclusions with peers and colleagues in a non-competitive environment. A hallmark of the network, the idea sharing and collaboration opportunities at the Summit are another incentive for members of the fluid power industry to attend and participate. If you were unable to attend the Summit last fall, the spring Summit is scheduled for June 4-6, 2019 at Purdue University in West Lafayette, Indiana, and will include a tour of the largest academic hydraulics lab in the U.S. For more information and to register, visit www.ccefp.org/engagement/summits.